Geeta Hippie clothes. Geeta Bohemian clothing. Artsy clothing for expressive women! Since 1972 Geeta of India has lead the way in creating classic gypsy hippie chick bohemian shabby chic styles for women and juniors. Handmade boutique styles at affordable prices. 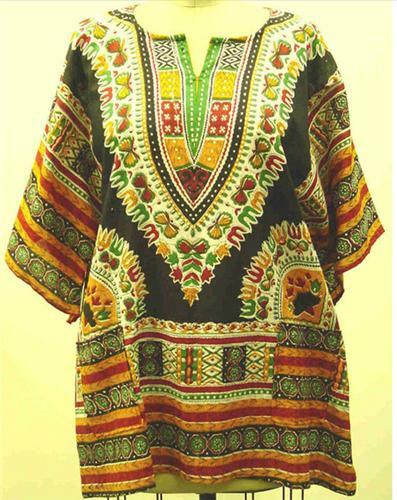 100% cotton One Size Fits Most Dashiki top with 5 inch side slits at each side of hemline batwing sleeves and two pockets.Traditional African Indian Rasta print. A classic top, this dashiki will compliment a wide variety of hippie bohemian skirts and pants as well as jeans. Because of the handmade nature of these items, sizing varies. The measurements here represent an average measure of this garment. Some variation of color and pattern can occur because each item is handmade and fabrics differ slightly from batch to batch. The item you receive may not match the picture exactly but will come close in our opinion. The items in the photos are not the exact item you will receive. Check the measurements below.